Other Products: Cutting file mantel Clock Dreaming Tree, Clock Components, Flat back Rhine stones, Images fairies and butterfly (internet), Beads, Miniature train sands, Pearl pen creme, White marker, Embossing folder wood, Filigree element, Silhouette machine, Distress Ink Vintage photo, Distress Ink Fossilized Amber, Acetate, Brown cardstock, Black Cardstock, Creme cardstock, wire, Glue gun, Big shot. Instructions: Click here to view a larger photo of this project. Start with Cutting the clock file found here out of all the cardstock and glue it together as the instructions tell you. It is all on the Dreaming tree site if you click on the clock you get the instructions. Then put on the clock components, for the front and sides I used the design paper from the collection. On the sides of the clock you can use the embossing folder, put some brown cardstock in the folder and run it through the Big Shot machine and glue them on the side. ROSES: Stamp the Big Yellow Peony with Peanut brittle on White cardstock, and the Pink one with Rhubarb Stalk and cut them out with the coordinating die, then color the yellow one with Peanut brittle and Distress Ink Fossilized amber, and the pink one with peanut brittle in the center and the rest of the flower with Vibrant Fuchsia. 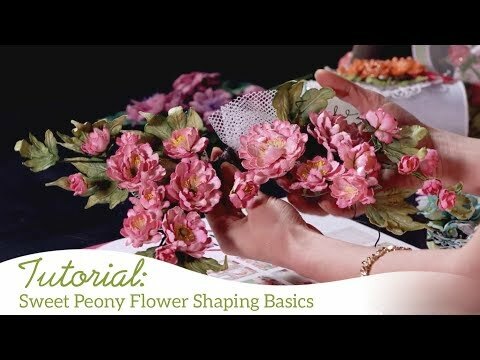 Now you can shape the flowers with the Deluxe Flower Shaping Kit. CONEFLOWERS: Stamp the flowers with Rich Cocoa on White cardstock and color them with the Vibrant Fuchsia, and the yellow ones with Fossilized Amber and in the center tangelo, for the leaves I used a mix of the bamboo leaves and leaf Green. For the 3D Coneflowers you take a bead on a wire and then stamp an extra peony petal, color this in the same colors as the other Coneflowers, then make a hole in the center and pull the bead through that and secure it with hot glue, then fold the leaves backwards, put some glue on all of the coneflowers tops take some of the (Miniature) sand and dip the tops in that, now you have nice pollens on top of your flower! And on top of the flower petals you can put a white line with the white marker. GREENERY: For the rest of the green and Flowers use the rain Boots and Blossoms collection and the rose Classic Rose vine, and the backyard Blossoms. Stamp them on white cardstock with the Rich Cocoa and color them with a mix of Bamboo leaves and leaf Green, on the rose leaves you can put some Vintage photo too then cut all the leaves and flowers with the coordinating dies and shape them with the Deluxe Shaping tool set! On some of the petals you can glue some flat back Rhinestones and on top of some flower branches add some pearl pen dots. Cut out the fairies and Butterfly and put glue on the wings and on top of that some Crystallos Shard Glass, let them dry, behind the flying fairy you can put a piece of acetate then it will fly in front of the clock cover the acetate with some leaves. The other fairy is sitting on the right side corner with a flat back Rhinestone in his hand. 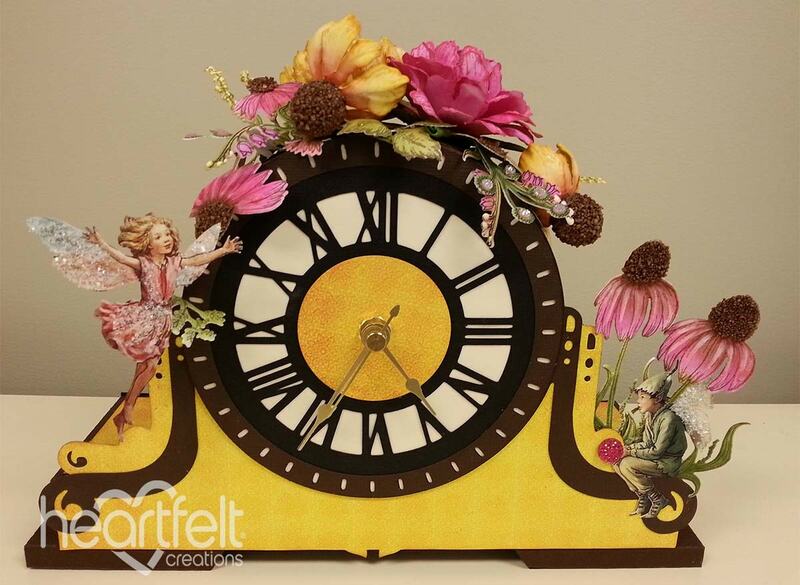 Now make a nice arrangement on top of the clock with all the flowers you like. Glue the filligree element on the bottom front of the clock and at last put a battery in the clock! Done!